Rage’s fifth full-length and first of the nineties continues the path they’d taken thus far towards even catchier realms. It’s quite staggering to look back and realise that since the band first came into being in 1986, they’d released an album a year without producing a dud, and Reflections Of A Shadow continues this run of quality. Despite the gloomy artwork, this is quite a cheerful and catchy listen, some of the wilder Speed Metal flourishes of yesteryear tuned down somewhat in favour of a mid-paced catchiness that seems ever-capable of slipping its bonds and zooming off into unbridled soloing. Peavy Wagner’s voice is still a high shriek that resists control and shoots about atop the music like an escaped monkey, but he is learning to sing a little, the ballad-y True Face In Everyone verging on Power Metal at certain moments. Keeping the same line-up for several albums has somewhat stabilised the band instrumentally – Chris Efthimiadis’ drumming is still rather dull, but guitarist Manni Schmidt more than makes up for it by playing his heart out. The riffs and solos are rarely short of breathtaking. Even if you find, for example, the aforementioned True Face In Everyone rather dull at first, the wave of guitar wizardry that ends it will more than change your mind. It’s interesting, too, that the band seem to have found a happy middle between their experimental and poppy impulses in songwriting terms, several tracks having odd structural flourishes but never losing sight of the catchiness. Flowers That Fade In My Hand is a good example, over seven minutes long and veering between 80s keyboard-driven pop and Heavy Metal thunder almost chaotically – it’s sort of like Genesis getting very drunk, firing Phil Collins and deciding that they want to play Prog Metal. Of course, this all takes a little getting used to if the wackiest thing you listen to is Edguy. Fortunately, Rage anticipated this, and threw in some riff-driven bits of pure headbangability to keep everyone listening whilst the odder songs took their time to grow. The title track is a good example of this, vocal yells and a melodic chorus over powerful riff-driven Metal that verges on Thrash at moments. Rage either have no sense of humour, or a very good one indeed – how else to explain the random keyboard intro to Can’t Get Out, which is roughly what you’d get if you got Mike Patton high and asked him to cover Helloween’s I Want Out? Waiting For The Moon, conversely, is almost suspiciously typical Power Metal, completely lacking in keyboard wackiness and having the sort of grooving central riff that’s sure to stick in your head for weeks after. Elsewhere, songs like Saddle The Wind are bread-and-butter for the band, catchy Heavy Metal anthems that are very hard to get tired of. 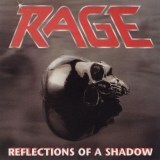 It’s hard not to like Rage anyways, but Reflections Of A Shadow makes it that much easier. Listening to this album for the first time, I can remember being genuinely hooked, unsure what was waiting just around the corner but knowing that the chances are I would enjoy it, and listening again now the album definitely gets better with familiarity. As a whole it’s aged well, barely sounding nearly twenty years old at all, and what’s more the bonus tracks on the remaster are well worth a listen too, which is something I rarely get to say. A great album, anyways, and more than recommended.